Want to Know More about the School Progress Report? The District’s Overall School Performance has increased three years in a row, from 33% to 42%. The District now has twice as many higher-performing schools and 50% fewer lower performing schools, as they did in 2014. 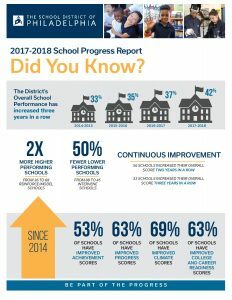 We are seeing continuous improvement, with 56 schools increasing their overall score two years in a row, and 33 schools increasing their overall score three years in a row. Be Part of the Progress!